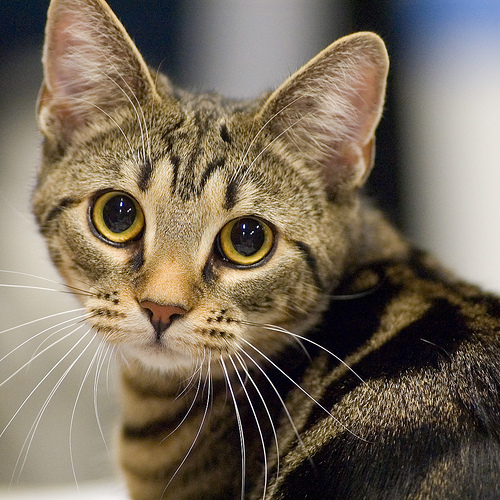 Appearance: Bramblekit is a typical brown tabby. She is a dark brown with black stripes going down her sides. Her tail has black rings going down it to its black tip. Her eyes are a bright amber color, and are very large. When she stalks through the forest she is hard to see because of her coat pattern, making her a good hunter. Her face is always bright and cheerful, much like her personality. Lastly, her claws are very long, giving her an advantage to other cats in battle, or in the skill of climbing trees. One bad thing is she has a bad hip, she was born with it, and most of the time it isn't a problem, but sometimes she will get a blinding pain from it for no reason it seems. Personality: Bramblekit is an extremely hyper kitten. She loves to play- and play fight. She has a very out going personality, and when she wants something done, she will get it done. She is a go getter and a team player. She will always think of others before making a decision. This gives her good leadership qualities, though she does not think about being a leader figure. She is happy where she is. The only time you can find this kit sad is when you speak of her family, and her past, or when she was sick with the greencough before being found by Windclan. She was lucky to survive the disease. Her bright personality also earns her friend ships, and she is never rude to another cat, unless they disrespect her clan, which she takes as an offense to herself. All in all she is a loyal, fun loving kit, that will grow up to be a strong and valiant warrior. History: TBA, other than she was not born in the clan, but as a rogue, and grew up alone, was found by Windclan, owes them her life. ~Accepted~ GREAT bios by the way.